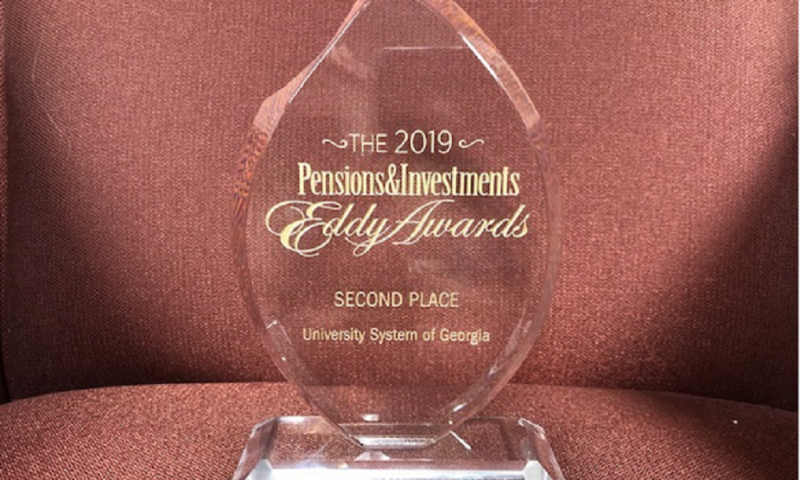 The University System of Georgia took second place in the financial wellness category, among the not-for-profit/other group of plans, at the annual Eddy Awards, sponsored by Pensions & Investments. Since 2016, the University System of Georgia’s “Money Monday” program has brought financial education to employees through themed, monthly workshops. Other techniques have included incentivizing employees to complete online financial education quizzes from TIAA and attend free, individual financial coaching sessions. Judges were impressed by the number of financial education events offered and liked the consistency of “Money Monday.” USG provided evidence of the effectiveness of the program, such as an increase in participation. The awards were presented at P&I’s annual East Coast Defined Contribution Conference in Ft. Lauderdale, Florida. On hand to receive the award and represent USG was Karin Elliott, associate vice chancellor for total rewards, and Farrah Williams, benefits wellness program manager. Pensions & Investments accepted entries for the 2019 Eddy Awards annual program recognizing plan sponsors and service providers that exhibit best practices in offering investment and financial education to defined contribution plan participants. P&I added a new category to the Eddy Awards in 2019 — financial wellness — in recognition of sponsors’ growing interest in helping participants better manage their financial lives. Financial wellness: Workplace experts increasingly warn that employees’ financial stress can damage their productivity, health, and ability to retire. This category, new for 2019, aims to recognize efforts that take a holistic view of employees’ financial well-being outside of traditional retirement programs. Those efforts include, but are not limited to, education or tools regarding student loans, health savings accounts, emergency savings or debt reduction, and household budgeting. Also, in the financial wellness category, Cone Health (VALIC-an AIG company) took first place among the not-for-profit/other group of plans, and Virginia Retirement System (iGrad/Enrich) received the best score for public plans. There was a tie for first place among corporate plans with more than 5,000 participants: Black & Veatch (Charles Schwab & Co.) and DENSO (Empower Retirement). The winner in the corporate plan group for 1,000 to 5,000 employees was Griffith Food Groups Inc. (Wells Fargo Institutional Retirement and Trust), and the winner for corporate plans with fewer than 1,000 employees was The Boldt Co. (Francis Investment Counsel). All USG employees are welcome to participate in Money Monday. Join us on Monday, March 25, 12 p.m. for Money at Work 1: Foundations of Investing to be presented by TIAA at Clayton State University (in-person) or join us via WebEx by registering today. All USG employees are welcome to schedule a free, confidential appointment with a financial coach. Get answers to your financial questions and become better prepared for your future. · For a list of financial planning webinars go to the USG Retirement website. Go to the USG Well-being website to be part of the journey and see additional upcoming events!